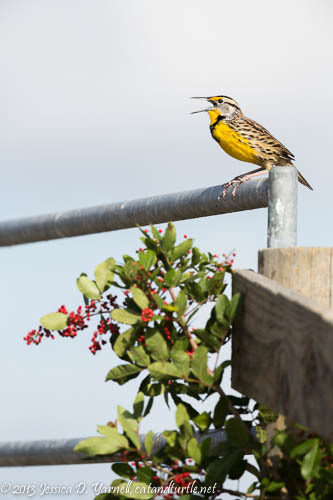 A friendly Eastern Meadowlark was very cooperative for us. 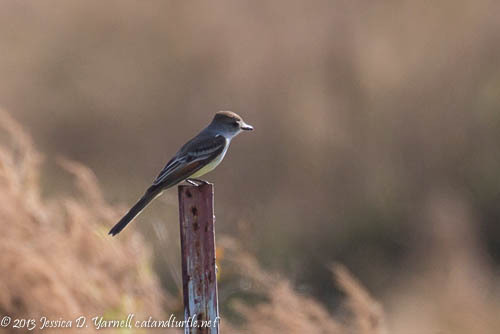 Maybe he felt badly that we didn’t get great shots of the Ash-throated Flycatcher, so he decided to pose. He sat on a fencepost and sang his heart out for us. It was very windy, and I was hand-handling the Beast. It was hard to keep the bird in the frame with the wind blowing so hard! I kept hoping he’d hop down to a berry bush below his fence, but he wasn’t that cooperative. An American Kestrel hopped out to say hello to us, but he wouldn’t pose. Kestrels are very skittish. 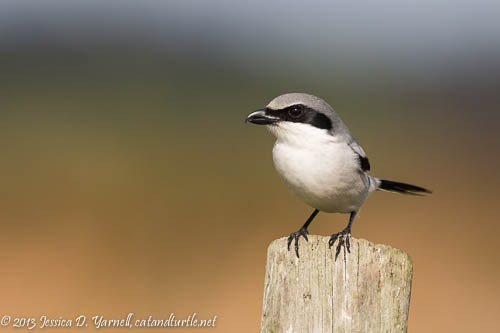 The fencepost and barbed wire environment is perfect for Loggerhead Shrikes, and we saw several out in the fields. This one below let us get very close and photograph him. We stayed with him for a while, hoping he’d grab a grasshopper or something. He didn’t. So it was a somewhat quiet end to our morning’s adventure, but it’s always fun to go new places. I can’t believe I’ve never driven down the road to the Moccasin Island Tract before. It’s so close to the Viera Wetlands. I’m sure I will be back!